Customizable spool holder for M3D printer by evandepol is licensed under the Creative Commons - Attribution - Share Alike license. 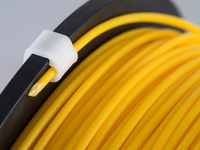 This spool holder is intended for the Micro3D printer, and sits on top of the unit, above the extruder, and using the printer chassis as base. These are brackets only. Two sets are needed, one for each side, then simply add any dowel, rod or tubing of your choosing to complete this thing. Use the customizer on the right and select the tubing diameter you plan to use for the vertical risers and top axle, and the model will adapt. Be careful not to make the vertical fit too snug, or the brackets may split apart. The vertical risers can be anything that make it tall enough to clear the printer and fit your spool size, minimum 3" recommended; I use 6" vertical risers. 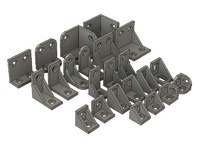 The top brackets hold a horizontal axle, which can easily lift out to change filament. The horizontal top tube needs to be 6.25" in length, and can fit multiple spools. Update 20160110: the "Global" section in the scad file caused parameters to no longer display in December. This should now work again. 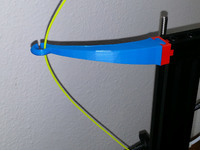 This is an evolution of a holder I made earlier (http://www.thingiverse.com/thing:707089), and allows for customization to suit any size rod.